The exhibition features an international and local roster of artists and organizations whose work celebrates the interdisciplinary nature of Transmission Arts and is made manifest in video, sound, radio, installation, performance, and work-on-paper. In A Noospheric Atlas of New York, Brett Ian Balogh (Chicago, IL) maps the hertzian space created by the New York’s mass media broadcast stations. This space is not definable in the traditional terms of the surveyed boundaries of state territories, but rather by electrical field strengths and consumer markets. Geospatial data provided by the Federal Communications Commission is rendered as translucent shapes whose color is determined by the type of service (AM/FM/TV). With RELAY, Max Goldfarb (Hudson, NY) presents a grouping of Ambulant Transceivers, a series of handmade radio transceivers constructed from reconstituted radio-electronic components, housed inside vintage first-aid tins. The adjacent video, Locations:Relay, represents an equally hand-made security system in the form of a community-watch perimeter check. The localized security network is cobbled together by many collaborating members of an unspecified village: each voice transmission attached to aerial imagery of the territory. Sam Sebren (Athens, NY) presents 9/11-QVC, an off-air single-channel video work. On the 10th Anniversary of the September 11 attacks in New York City, Sebren videotaped himself toggling his television dial between news coverage in memorial of the attacks and a home shopping network’s regularly scheduled programming. Here Sebren “performs” with a palette of commercial television broadcast re-presenting these transmissions in a critical and reflective light. 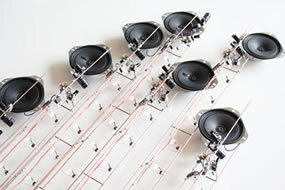 Fill, by Maria Papadomanolaki (New York, NY) is an interactive sound installation using low-power radio transmission. To experience Fill, attendees will borrow a small radio transceiver and move about the space. Papadomanolaki’s microcast is designed to highlight the physical properties of her site-specific transmission. Gallery goers will observe distinct changes in what they hear based on their position and movement in the GCCA exhibition space. Phillip Stearns (Brooklyn, NY) presents his work Deluge, a sound and light installation that depicts the white noise of unoccupied radio frequencies as a showering rain of light. As digital technologies become more adept at reducing interference and noise through omission and censorship, we are quickly losing touch with unmediated white noise, that static hush in between the stations, and playground for the imagination. Many antenna like structures, LED strands are clustered together, each representing the activity of the broadband white noise being picked up by simple transistor receivers. From these discrete elements, a cloud of lights is formed, filling the space with a form activated by the absence of pre-determined content. The sculpture plays on the poetics hidden within the language of both analog and digital electronics. Presented as listening stations, Transmittal also includes special selections from two recent international radio art exhibitions: Radio Arts Space by radioCona (Ljubljana, Slovenia), and Radio Boredcast co-commissioned by AV Festival 12 and Pixel Palace, hosted by basic.fm (Newcastle, UK). In conjunction with the Transmittal exhibtion, Radio Arts Space programs will also be presented on WGXC 90.7-FM on seven consecutive nights at 1:00 a.m. April 29 – May 5, 2012.